After six years of kicking around the official language for an updated Carl D. Perkins Career and Technical Education bill, Congress and the president have voted and signed the act into law. The Perkins Act, H.R. 2353 (115), which has been considered for reauthorization since 2012, commits between $1.2 billion and $1.3 billion for the program over the next six years. The law will take effect beginning on July 1, 2019. Among the changes from its original 2006 version: less federal oversight, more state control for setting CTE goals and encouragement for states to pass along the bulk of funding to local communities to meet their individual needs. The Perkins Act supports career preparation programs with funding and encourages stronger connections between K-12, higher education, alternative education providers and hiring employers. 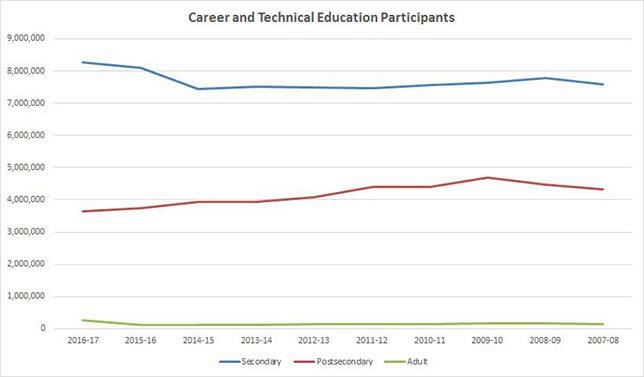 According to the Perkins Data Explorer, demand for CTE has remained steady. During the 2016-207 school year the program served 8.3 million students in high school, 3.6 million students in college and 254,000 adults. In total, that's up by only about 200,000 people from the previous year and down from a high of 12.5 million in 2009-2010. Data source: Perkins Data Explorer. Renamed the "Strengthening Career and Technical Education for the 21st Century Act," the new law drew bipartisan Congressional support and was heralded by multiple sources. "Both common sense and the science of learning show that students learn best by doing; quality [CTE] engages students' interests while preparing them for meaningful careers," said Alliance for Excellent Education President, Bob Wise, in a statement. "By updating the federal law supporting career and technical education, Congress completed an important summer homework assignment. I applaud their bipartisan work and I look forward to supporting states, school districts, institutions of higher education, and employers, as they implement this new law." The National Immigration Forum liked the Act because it funds programs that "help immigrants meet employers' needs." As the immigrant advocacy organization noted, "Certificates, licenses and the education gained from CTE programs allow immigrants and other workers to secure better jobs and fulfill their career potential. Maximizing the contributions of immigrants can help meet employers' needs, strengthening our economy." 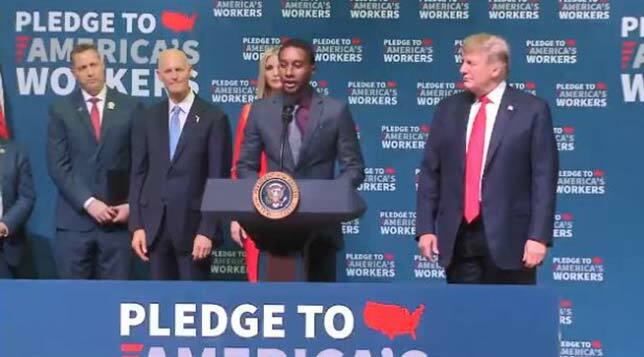 President Trump acknowledged the importance of the bill--the first substantive education success of his administration--with a speech at Florida's Tampa Bay Tech High School, accompanied by his Education Secretary, Betsy DeVos, and his daughter (and White House advisor) Ivanka Trump, who had, according to Politico, "pushed Congress to pass the bill." As he told those in attendance, "By enacting [Perkins] into law, we will continue to prepare students for today's constantly shifting job market, and we will help employers find the workers they need to compete." According to an analysis published by The Hill, the new Perkins gives states "more freedom" to set goals and align their "education standards with workforce needs," without having to negotiate on those with the U.S. Department of Education (even though plans still need to go to Ed for states to receive their allocations). The act also imposes a two-year deadline for states to achieve their chosen goals; if they fail, the act threatens, their funding will dry up. The bill also helps smaller districts, which don't always participate in the federal CTE program because "the administrative hurdles are too expensive or burdensome," by clearing "some of those obstacles." A summary by the Association for Career and Technical Education and Advance CTE highlighted numerous changes to definitions, many of which were put in place to better align with the Every Student Succeeds Act and with the Workforce Innovation and Opportunity Act, the organizations wrote. For example, the definition for CTE itself specifies that "content must be aligned with ESSA's state-identified academic standards at the secondary level and with rigorous academic standards at the postsecondary level." The report said that state agencies in charge of CTE will need to develop two plans during an authorization period--one for a one-year transition and the other a four-year plan. After that, states will need to decide whether to submit a second four-year plan, which will cover the sixth year of allocations and three additional years, or to submit annual revisions. How the agency will get stakeholders to participate "in the planning, development, implementation and evaluation of CTE programs." Middle grades also received a mention in Perkins. The new law expects local use of funds to include a way to introduce students in middle grades to CTE opportunities as part of career exploration activities and career guidance. New America gives kudos to the new bill for its emphasis on evidence-based CTE models. One sign of that is creation of an "innovation and modernization fund" at the federal level to develop and scale "evidence-based interventions that improve program quality and student outcomes." The secretary of education can dedicate up to 20 percent of the federal activities budget to this fund, about $1.5 million per year. The non-partisan thinktank also gave a nod to a raise from 10 percent to 15 percent in the amount of discretionary reserve funding states may allocate to local programs, intended to increase support for rural areas and areas with a high concentration of CTE students and to address performance gaps in "subpopulations of CTE students." What caused concern among New America analysts was the approach Perkins is taking to accountability. The law "establishes separate performance indicators for high school and postsecondary CTE students," but limits the measures to 'concentrators'--defined as students who take at least two courses in high school or who earn at least 12 college credits within a CTE program or complete a program with fewer credits. There are plenty of CTE participants who won't qualify as concentrators, leaving them out of the accounting. This limitation, the analysts predicted, will dilute efforts to "assess education and labor market trends" in relation to the Perkins-funded programs. "With only a few shortcomings, the Senate's bipartisan Perkins CTE bill could provide better data on outcomes while improving coordination between workforce investments," noted New America. But all in all, it concluded, "At a time when it's hard to find common ground, it's nice to see Congress come together to improve programs for CTE students."